This year we have again an El Niño Southern Oscillation (ENSO) which causes a long dry season in Kalimantan with fires, smoke and haze. Through the opening of Peat Swamp Forest (PSF) mainly by the Mega Rice Project (MRP) from 1996 - 1998 and opening of the forests many peatlands were dried out by building more than 4000km of drainage channels. 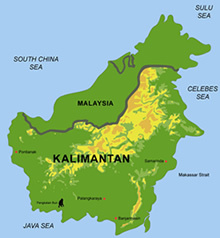 The tropical peat in Kalimantan has a thickness of up to 12m to 15m, created in the last 10,000 years. In the ENSO 1997 and 2002 the trees and debris's burned only, now the peat itself is burning and produces smoke and haze which creates burned particles in the size of 10 µm. Strong carbon emission is taking place. I was for two weeks at the beginning of October in Palangkaraya, when we had strong smoke, which increased in the last days. The schools in Central Kalimantan were closed and the airport of Palangka Raya too. The fires, haze and smoke are really terrible. Even after several days after my arrival in Germany my suit case smelled strongly after fire. The smoke is for the nature and the health of the local people unacceptable. If there is not a strong will by the government and the local people to stop the fires (all fires are caused by human activities), we will have the haze situation each year during the dry season with the burning peat layers. It rained heavily on the 10. November 2006.